f you ask me, the most stressful job in this world is choosing gifts for your loved ones. First, you have to think from the shoes of recipient and figure out what he/she might like. You have to brainstorm within yourself and conclude on something. You should also anticipate the response you would be getting from that person after unwrapping it. If it is a wide smile, or tears of happiness, a thank you from the heart, a bear hug or a passionate kiss… you would pat on yourself on your back – Mission accomplished!!!! Soon, all the efforts would look like cakewalk (though you know that it was not). However, for some unfortunate reasons if the recipient doesn’t like it, then, you would feel miserable like never before. So, as you can see, buying gifts to loved ones is more about ourselves than the recipient per se. It is about how happy we would feel by seeing them happy. Therefore, it comes back to the same old million dollar question – what gift could make him/her happy?! For all of you who have this question in their mind, I have one option to think about - A Story Box!!! It would be really appealing and flattering if your recipient enjoys reading. You can also give it as a gift to anyone whom you think can (re)start their reading habit. In short, this is a brilliant gift idea. Last week, when I received the package, I was excited beyond words. When I opened the box which looks more like a hardcover book, I was flabbergasted to see an assortment of things – an exquisite metallic bookmark, 4 wooden coasters with nice quotes and a beautiful hand-stitched journal! I saw that the friends who were there with me when I opened the book were equally happy. That’s when I realized that this box is something more than a hodgepodge – but they are well chosen things that would steal the recipient’s heart! 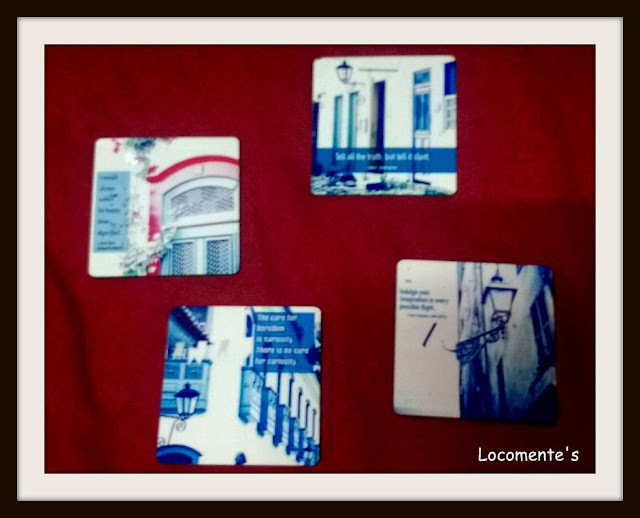 Four custom made coasters with beautiful imagery and quotes from plucky women writers. Material: Digitally printed on high quality MDF with wipe-able gloss finish. Coasters with nice Quotes - Food for Intellects! 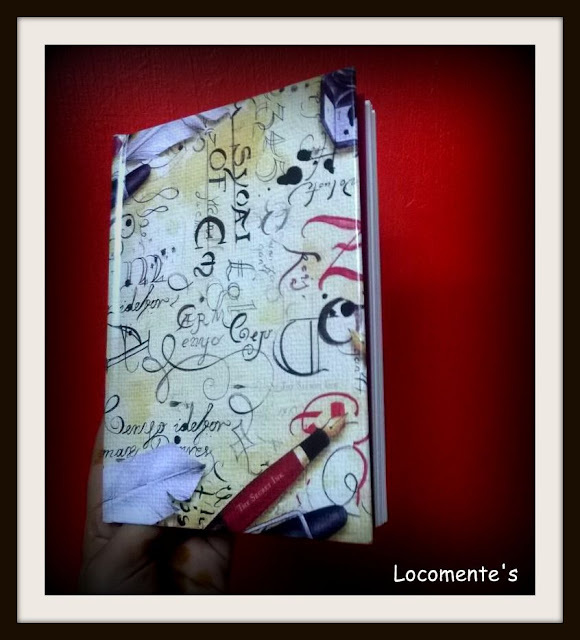 A hardbound, hand stitched journal; just what you need to pen that unwritten saga in your head. Beautiful Journal - Writer's Asset! 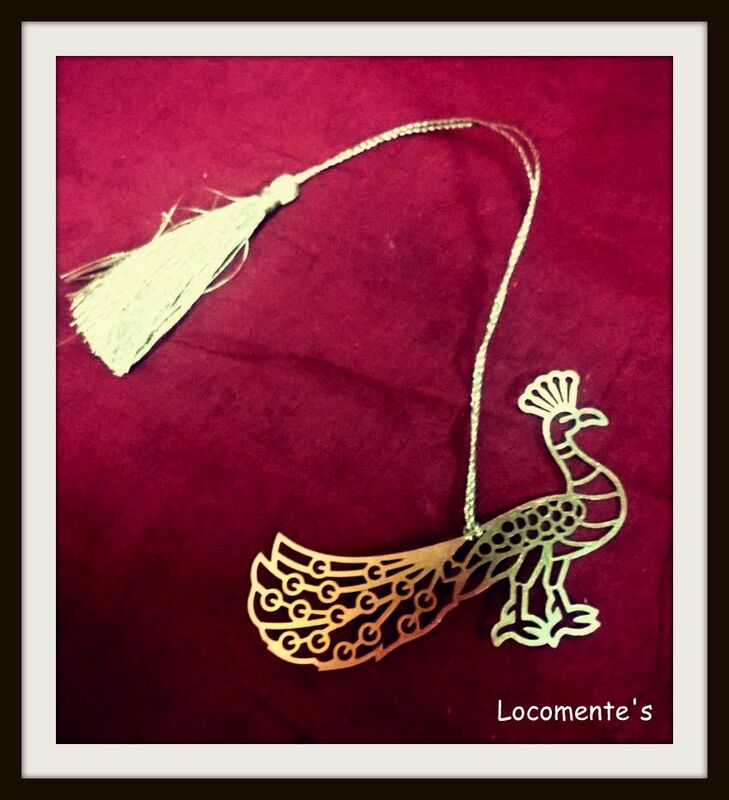 An intricately cut bookmark with golden lacquered finish; something that you will treasure for ever. Intricate Bookmark - Reader's Pride! So all you people who are looking for a perfect gift – Story box is an option! 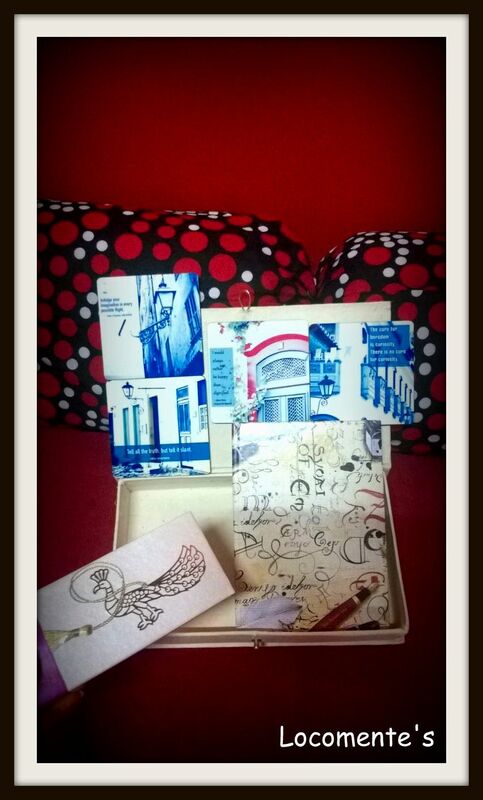 PS: Thanks to MyBigRedBag for giving away this wonderful Book Lover’s story box for review! That book mark is so cute! That seems to be a nice gift. Loved the bookmark!! So pretty! That must have been a thoughtful gifter.Or he /she may have sensed your liking. But conversely if you were not the person with such tastes , well then?? But imagine... if someone goes out of their way... Thinks about gift ideas and presents something both unique and useful!!! !